More Advanced Surgery is Here. Ask about our new da Vinci® robots. ...is right here in Northern Kentucky. Click here to learn more. Our sports medicine and affiliated orthopaedic experts are right here to provide you the right care, every step of the way. Click here to learn more. Users can access their current medications and medical history and easily schedule their next appointment, all online. Several common conditions can be treated from the comfort of your home. At just $35 it’s an extraordinary convenience through innovation. We are dedicated to helping our associates reach their career goals not only by offering competitive benefits and career development programs, but also by creating a community to foster excellence among our team members. We provide award winning healthcare to Northern Kentucky, Greater Cincinnati and Southeastern Indiana. Our physician recruitment team ensures that our community has access to high quality healthcare providers. 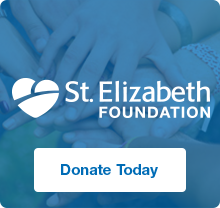 Volunteering at St. Elizabeth is a commitment that not only helps others, but is personally rewarding too. We have teen, college student, and adult volunteer opportunities. We look forward to connecting with you! At St. Elizabeth, we know how important quick, convenient, on-the-go access to your healthcare provider is to you. From looking up a phone number to getting directions to an office to sending a quick message through MyChart, we designed our mobile app around the features you value most! The post Need a Reason to Quit Smoking? Here are Five. appeared first on Healthy Headlines. The American Cancer Society recommends an annual screening mammogram starting at the age of 40. The CardioVascular Mobile Health Unit (CVMHU) provides cardiovascular screenings at locations throughout the community. The Auxiliary Gift Shop at St. Elizabeth Florence and St. Elizabeth Ft.Thomas partners with local organizations throughout the year to offer you special discounts on a variety of goods. For each of these events, a portion of the proceeds are donated back to St. Elizabeth Healthcare. Come learn about all things diabetes technology! Freshstart is a FREE 4-week smoking cessation program developed by the American Cancer Society and offered to you by St. Elizabeth Healthcare. Taught by a Certified Lactation Consultant/counselor, this class offers in-depth preparation for breastfeeding. Free to mothers attending childbirth classes.